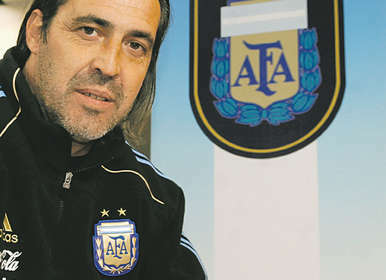 After really far too long, the Asociación de Fútbol Argentino will finally confirm Sergio Batista as the permanent manager of the Argentine national team today, following yesterday’s meeting in Ezeieza. Batista’s knowledge of his players, record (and knowledge) with the youth team, relationship with the group and the fact he’s got Lionel Messi’s support were all points in his favour. Diego Maradona was predictably unimpressed, claiming; ‘They could dress him up like Piñón Fijo [a bafflingly popular and phenomenally irritating television clown] and Messi would love him.’ Now, now, Diego. You had your chance and it was like watching the real Piñón Fijo manage. It’s time to let the adults have a go. Batista’s era begins today, then, and is expected to mean a greater role for Javier Pastore in the future of the selección as well as the return to the fold – eventually – of Juan Román Riquelme, self-exiled during Maradona’s time in charge. The ‘local selección‘ will continue, and there’ll also be an Under 25 side for players based abroad who aren’t yet ready for the full national team. Who on earth they’re going to play against is anyone’s idea, but it might well include players like Almería’s Pablo Piatti, Lazio’s Mauro Zárate and Genoa’s Franco Zuculini. There will also be an assistant with a permanent office in Madrid to keep an eye on the Europe-based players and to keep an ear open for news of any young Argentina-eligible kids coming through the youth systems of (especially) Spanish and Italian club sides. The AFA want to make sure they don’t miss out on promising talent as they once feared they might with Lionel Messi following his move to Barcelona at a young age. This job is likely to go to an ex-player still living in Europe. It’s yet to be decided who that might be, but since he already lives in Madrid I’m going to make my own guess (and that’s all it is) and suggest that if it doesn’t clash with his responsibilities at Real Madrid, Jorge Valdano might be well placed. Fixture-wise, Argentina have a date on the 17th of this month in Qatar against Brazil, before breaking for the Christmas and new year period. Their next date will be against England on the 9th February 2011, which I believe will be on neutral territory somewhere in Europe (and might be an interesting day to be English in Buenos Aires). Between the 25th and 29th March they’ll take place in a three-team friendly competition in the United States, against the USA and Mexico. On the 7th June they’ll play Italy in – for some reason – Montreal, Canada, and and on the 3rd July the Copa América begins right here in Argentina, for three weeks. Franco Zuculini is currently playing for Genoa in Italy, not Hoffenheim as stated originally above. Thanks to Dan at Argentina Football World for setting me straight on that. i thought they will play with brazil on 17th? You seem to be right sobstel, the site I copied those fixtures from had the wrong date yesterday. I’ll correct it right now, thanks for pointing it out.